Day 1: Déja vu all over again! The day had finally come for the volunteers to arrive and start the dig in earnest. I was on site at 8am to take a delivery of tools to get going with. While waiting at the gate to meet the van when it arrived, a hare ambled slowly up the trackway, past the car and crossed the road into the opposite field, a journey he probably takes every day. He wasn’t too upset by my presence, although I was sitting in the car – this must be an auspicious omen. Fin, on her way to the Blackfriary site in Trim very kindly dropped off the absolute essentials to get the work started. We got a great collection of mattocks and shovels, a wheelbarrow and a number of ‘experienced’ buckets. How many archaeologists does it take to change a lightbulb...? Matt arrived bright and early on the site as well and we started to sort some of the gear. Closer to 9am the volunteers began to arrive; some travelling from Dublin, others from Dundalk, Ardee and Drogheda. Some old faces are back again for more – as well as Matt, who is supervising again, Darren has come back to the site for season 2 as has Eimear. It is nice to know that at least some people weren’t too badly put off the whole archaeology business and it will be great to have some continuity from last year. A number of new faces were present also and are very welcome. From Cultural Studies in DkIT we have Jamie, Sophie and Sarah. From the BA Humanities, Ciara and Lisa. From UCD, Mags and Niamh and from the University of Glasgow (although from Dublin), Tomás. Kevin was on hand again today to watch proceedings and lend a hand, very interested in the possibility of seeing some of the geophysical anomalies he identified in his surveys during the excavation. After the obligatory site tour, we set to assembling a pair of children’s single-seater swings. The intention is to use these to suspend our sieves from and take a little bit of the hard work out of that particular process. As I outlined before, because we are in a tillage field the top 25-30cm of soil is disturbed ploughsoil, which is full of artefacts, particularly flint. We are going to dig each cutting metre square by metre square and sieve removed material as we go in order to ensure the maximum rate of artefact recovery. 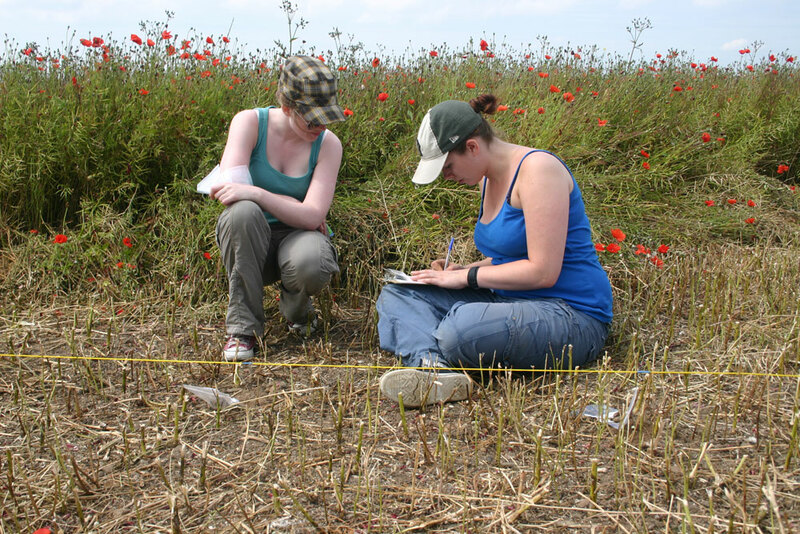 All finds will be localised to a particular metre square so we will later be able to plot the distribution of artefacts through the ploughsoil and hopefully gain additional insights into how the site was used in the past. 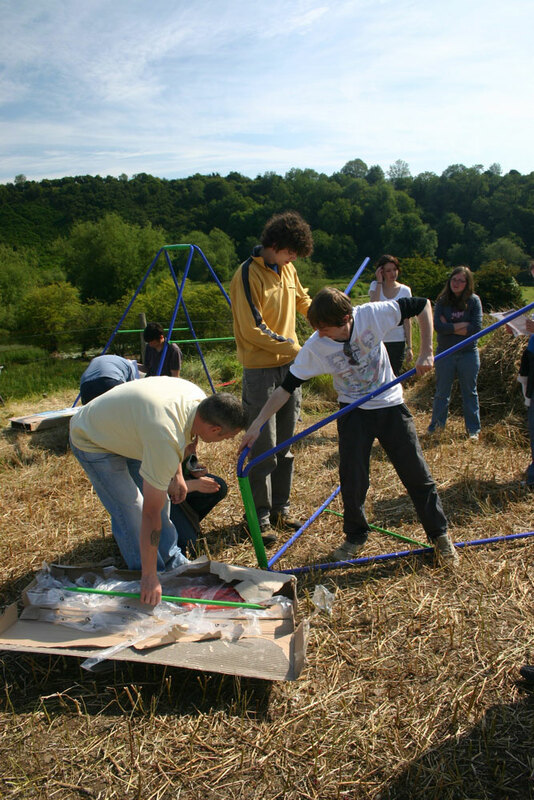 Once the swings were finally constructed – they’re not as easy to put together as the instructions suggest, even though they’re supposed to be for children – we went back up the field to the cabin to have a break. While we there our portaloo was delivered so we now have all mod cons onsite! 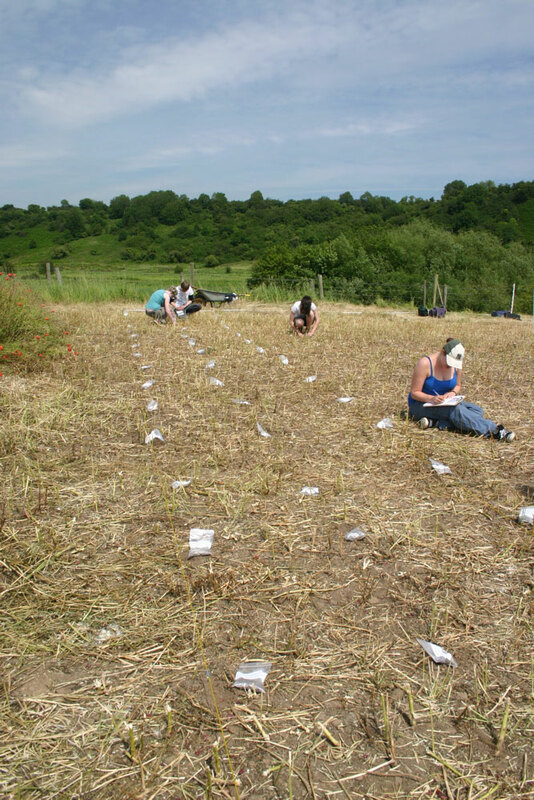 The magnetic susceptibility soil sampling grid. After tea, the next job on site was to take a series of soil samples over each area on a 1m x 1m grid. 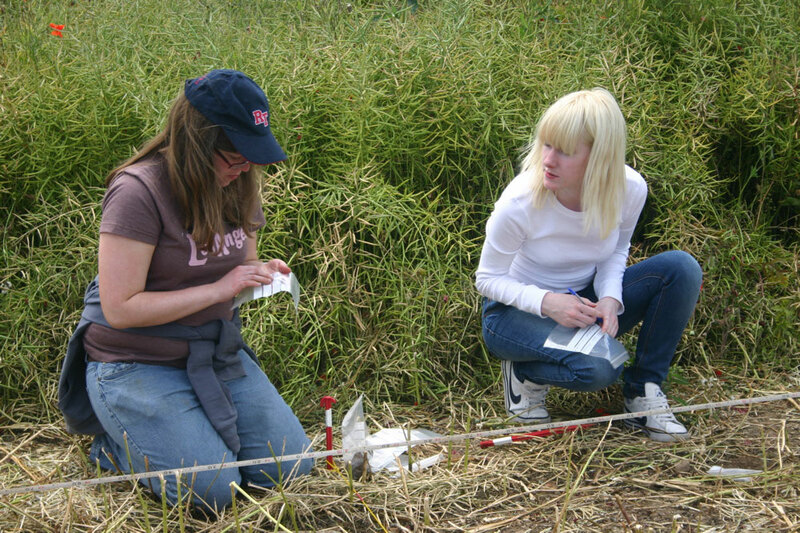 These samples will be measured in laboratory conditions to measure magnetic suscetibility. We had already carried out a mag susc survey over each area using a field loop but we decided that while we had the chance we would also carry out the much more accurate lab tests. There will be a very useful comparison of the performance of the field loop relative to the more accurate lab test. While carrying out the survey with the field loop we did get the strong impression that a significant proportion of the cobbles in the soil in the field were themselves slightly magnetic and were affecting the accuracy of the results. Thus, instead of measuring mag susc enhancement of the soil due to anthropogenic (human) activity like burning or deposition of organic waste, we were getting values based on the very mixed geology of the cobbles in the soil. The lab test will test this and provide much more accurate results. Each soil sample is processed in the lab – it is dried, sieved and then weighed so every sample measured is of equal weight. This cuts down significantly on variation in measurements and increases their overall accuracy. All of these samples had to be taken from the surface of the ploughsoil, to make sure all samples were comparable, so this job had to be done before any digging in the cuttings took place. So this became the first real archaeological task that a number of people on the site were ever given. I’m sure it is not something they thought they would be doing on their first day on site. We made very good progress and over the course of the rest of the day we took all of the samples over both areas amounting to 352 samples. All were bagged and labeled and hauled back up the hill to the cabin. Tomorrow, we will be digging and sieving. ps. The First Find of the Dig Award goes to Darren who found a flint flake and a sheep’s tooth on the surface as he was collecting his samples. Many thanks to Eimear who very kindly bought everyone ice cream after lunch. This entry was posted on July 4, 2011 by Conor Brady. It was filed under Archaeology .